A few Sunday mornings ago, we were walking up Fifth Avenue by the Forbes Building and two well-to-do gentlemen (one pushing his baby in a stroller) were speaking loudly about the cost and effects of healthcare reform upon their lives. One of the pair pontificated "...and why should they take my money so others can have coverage?!?!" After absorbing eye-opening news stories in the past few years of a mental patient dying at a Brooklyn Hospital after waiting almost 24 hours to be seen, and the dumping of homeless patients on Skid Row in Los Angeles by hospital vans, one has to wonder if the debate over healthcare will lead to an apex...a sort of coup de grace for our misguided species. A healthy response to the gentlemen on Fifth Avenue (and to other opponents of healthcare reform) was on the tip of my tongue, but it was troubling me that I couldn't remember the source or the exact words until this past weekend when I dug up the book Danny Lyon - Photo Film, published 1991 by Edition Braus. An essay in the book titled The Arc of Hope by Daniel Jesse Wolff notes: "A democracy, to survive," Felix Rohatyn said late in the 80's, "must at the very least appear to be fair. This is no longer the case in America." Mr. Wolff also notes: "Americans are notorious for their lack of class consciousness or even class awareness," writes economist Barbara Ehrenreich. "In the face of the most brutal personal dislocations, we lack a vocabulary to express our dismay." As President Obama pointed out in a recent opinion piece in the NY Times, nearly 46 million Americans (out of a total population of 305 million) currently do not have health insurance coverage. It is not their (or rather, our collective) fault. Some Americans are unemployed and uninsured because of the current recession, while others only work part-time positions that do not offer health benefits. Some even thought they were adequately covered until their insurance company refused to acknowledge and pay for certain treatments or pre-existing conditions. What if these 46 million "faceless" Americans showed up at the Washington Monument tomorrow and demonstrated and screamed out to insurance company CEOs, elected officials, and the pharmaceutical industry of their plight? Would big business then acknowledge that these 46 million strong exist or will they still send their battalion out to fight change and marginalize those who don't belong in their scripted and very profitable fairy tale? Senator Edward M. Kennedy, who passed away on August 25, 2009, has written of healthcare reform: "A century-long struggle will reach its climax,"..."We're almost there....I believe the bill will pass, and we will end the disgrace of America as the only major industrialized nation in the world that doesn't guarantee health care for all of its people." So why change, and why now? Because we should all understand by now the luck of birth for some and the plight at birth for others. Because we claim we live in a just society that believes in reason, intelligence and compassion over greed, excess and fear. And because for this country's democracy to survive (and big business and the wealthy know they have been extremely profitable in this system), it "must at the very least appear to be fair". Boys, it's time to play fair. 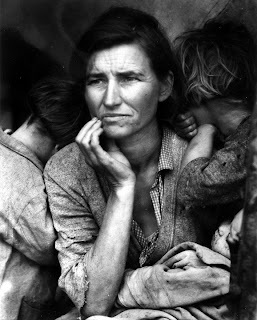 Rose of Sharon, a character in John Steinbeck's classic 1939 novel The Grapes of Wrath set in the Great Depression, would be proud of us all. David Gonzalez, a reporter for The New York Times wrote a personal and inspiring article today titled The Faces in the South Bronx Rubble that is recommended reading. 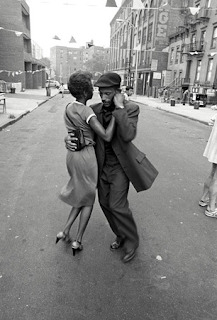 In 1979, armed with a Yale education and his camera, Mr. Gonzalez returned to the South Bronx to teach photography to children and also to document the life that he saw there. To be perfectly honest, I am often wary of the "stale, male, pale, Yale" masters of the universe world that the Guerrilla Girls have brought to light in the past. It's good to see some humanity come out of New Haven, Connecticut for a change and not just another manufactured tale of corporate know-how and triumph. 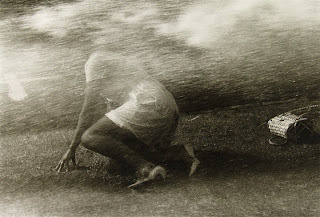 Please be sure to follow the link to the Audio Slide Show in the article to hear Mr. Gonzalez speak of his photographs. 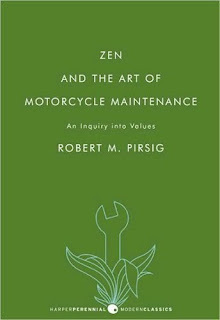 Years ago, during a peaceful stay on the island of Molokai, Hawaii, I found a beat-up copy of Zen and the Art of Motorcycle Maintenance by Robert M. Pirsig (first published 1974 by William Morrow and Company, Inc.) on the bookshelf at a local vacation rental. Between day trips to Kalaupapa and Halawa Valley and during the quiet evenings, I immersed myself in the book's descriptive journey and read about half of the paperback before our trip to the Friendly Isle ended. 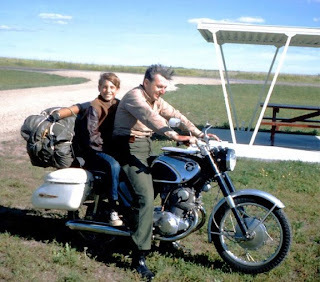 While most people are first introduced to Mr. Pirsig's writing in college, it actually took me until recently to complete the book in its entirety. In a nod to the author and the character Phaedrus, we probably all have to be a little insane to survive in this crazy world of ours. ..His early failure had released him from any felt obligation to think along institutional lines and his thoughts were already independent to a degree few people are familiar with. He felt that institutions such as schools, churches, governments and political organizations of every sort all tended to direct thought for ends other than truth, for the perpetuation of their own functions, and for the control of individuals in the service of these functions. If all of human knowledge, everything that's known, is believed to be an enormous hierarchic structure, then the high country of the mind is found at the uppermost reaches of this structure in the most general, the most abstract considerations of all. Few people travel here. There's no real profit to be made from wandering through it, yet like this high country of the material world all around us, it has its own austere beauty that to some people make the hardships of traveling through it seem worthwhile. 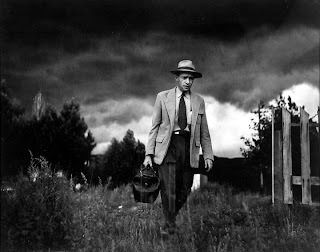 He returned to his Midwest, picked up a practical degree in journalism, married, lived in Nevada and Mexico, did odd jobs, worked as a journalist, a science writer and an industrial-advertising writer. He fathered two children, bought a farm and a riding horse and two cars and was starting to put on middle-age weight. His pursuit of what has been called the ghost of reason had been given up. That's extremely important to understand. He had given up. Because he'd given up, the surface of life was comfortable for him. He worked reasonably hard, was easy to get along with and, except for an occasional glimpse of inner emptiness shown in some short stories he wrote at the time, his days passed quite usually. What started him up here into these mountains isn't certain. His wife seems not to know, but I'd guess it was perhaps some of those inner feelings of failure and the hope that somehow this might take him back on the track again. He had become much more mature, as if the abandonment of his inner goals had caused him somehow to age more quickly. You are never dedicated to something you have complete confidence in. No one is fanatically shouting that the sun is going to rise tomorrow. They know it's going to rise tomorrow. When people are fanatically dedicated to political or religious faiths or any other kinds of dogmas or goals, it's always because those dogmas or goals are in doubt. It made the kids at camp much more enthusiastic and cooperative when they had ego goals to fulfill, I'm sure, but ultimately that kind of motivation is destructive. Any effort that has self-glorification as its final endpoint is bound to end in disaster. Now we're paying the price. When you try to climb a mountain to prove how big you are, you almost never make it. And even if you do it's a hollow victory. In order to sustain the victory you have to prove yourself again and again in some other way, and again and again and again, driven forever to fill a false image, haunted by the fear that the image is not true and someone will find out. That's never the way. The result is rather typical of modern technology, an overall dullness of appearance so depressing that it must be overlaid with a veneer of "style" to make it acceptable. And that, to anyone who is sensitive to romantic Quality, just makes it all the worse. Now it's not just depressingly dull, it's also phony. Put the two together and you get a pretty accurate basic description of modern American technology: stylized cars and stylized outboard motors and stylized typewriters and stylized clothes. Stylized refrigerators filled with stylized food in stylized kitchens in stylized houses. Plastic stylized toys for stylized children, who at Christmas and birthdays are in style with their stylish parents. You have to be awfully stylish yourself not to get sick of it once in a while. It's the style that gets you; technological ugliness syruped over with romantic phoniness in an effort to produce beauty and profit by people who, though stylish, don't know where to start because no one has ever told them there's such a thing as Quality in this world and it's real, not style. Quality isn't something you lay on top of subjects and objects like tinsel on a Christmas tree. Real Quality must be source of the subjects and objects, the cone from which the tree must start. I think that if we are going to reform the world, and make it a better place to live in, the way to do it is not with talk about relationships of a political nature, which are inevitably dualistic, full of subjects and objects and their relationship to one another; or with programs full of things for other people to do. I think that kind of approach starts it at the end and presumes the end is the beginning. Programs of a political nature are important end products of social quality that can be effective only if the underlying structure of social values is right. The social values are right only if the individual values are right. The place to improve the world is first in one's own heart and head and hands, and then work outward from there. Other people can talk about how to expand the destiny of mankind. I just want to talk about how to fix a motorcycle. I think that what I have to say has more lasting value. The answer, of course, is no, you still haven't got anything licked. You've got to live right too. It's the way you live that predisposes you to avoid the traps and see the right facts. You want to know how to paint a perfect painting? It's easy. Make yourself perfect and then just paint naturally. That's the way all the experts do it. The making of a painting or the fixing of a motorcycle isn't separate from the rest of your existence. If you're a sloppy thinker the six days of the week you aren't working on your machine, what trap avoidances, what gimmicks, can make you all of a sudden sharp on the seventh? It all goes together. But if you're a sloppy thinker six days a week and you really try to be sharp on the seventh, then maybe the next six days aren't going to be quite as sloppy as the preceding six. What I'm trying to come up with on these gumption traps, I guess, is shortcuts to living right. Along the streets that lead away from the apartment he can never see anything through the concrete and brick and neon but he knows that buried within it are grotesque, twisted souls forever trying the manners that will convince themselves they possess Quality, learning strange poses of style and glamour vended by dream magazines and other mass media, and paid for by the vendors of substance. He thinks of them at night alone with their advertised glamorous shoes and stockings and underclothes off, staring through the sooty windows at the grotesque shells revealed beyond them, when the poses weaken and the truth creeps in, the only truth that exists here, crying to heaven, God, there is nothing here but dead neon and cement and brick. Here's a link to an amusing article by Wayne Parry of the Associated Press reporting on legendary singer and songwriter Bob Dylan's recent "run-in" with the Long Branch, New Jersey police. The officers involved were in their twenties and apparently had no idea that Dylan is the artist known for influential hits such as Like a Rolling Stone, which was selected by Rolling Stone magazine as its Greatest Song of All Time. One of our favorite things to do everyday is to walk for miles at a time, experiencing the different neighborhoods and learning to really see and understand the city and its inhabitants. 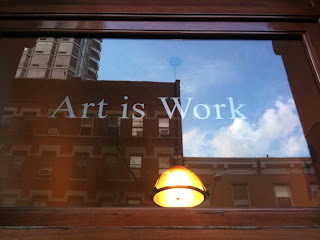 If you happen to explore the East 30's one day, you'll come across the artist and graphic designer Milton Glaser's studio and the intelligent signage above his doorway reading "Art is Work." 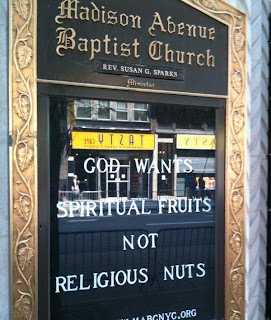 We're happy to see someone tell it to the world in such a thoughtful and succinct manner. Now if only all creative individuals could understand those simple words as well. "Life is an inevitable chain of losses since we are born. We lose the womb, our mothers, and we lose our childhood, and we lose our innocence, and we lose our friends in school, and we lose our dreams and our faith, and we lose our parents, and sometimes our jobs, and we lose our hair and our feet and our health, and in the end our life. But how do we confront that? How can we give meaning to our life even if that will happen, want it or not? These characters, there's a moment that they stop living and start surviving. And how can they return to life again? They learn something about themselves, they regain themselves. And that's the dignity of being human. I'm not trying to just put miserable people in miserable circumstances and a miserable ending. I think life is very bright and very beautiful, but it's also really dark and sometimes really frightening." Funny People, the latest film from director Judd Apatow opens this weekend, starring Adam Sandler, Seth Rogen, Leslie Mann and Eric Bana. Sandler's character is a successful comedian and Hollywood star who discovers he is afflicted with a possibly fatal blood disease, and this turn allows the actor to once again play to both his comedic and dramatic strengths. The challenge of a more dramatic role for Adam Sandler was first introduced in Paul Thomas Anderson's brilliant 2002 film Punch-Drunk Love. This reminds us we'll have to place it on our Netflix queue again. Emily Watson and Sandler's main characters serve up an unusual slice of contemporary romance to say the least. And as they also say...all you need is love. Quirky love was clearly on Mr. Anderson's mind as he chose to reuse a haunting track from the 1980 movie Popeye titled He Needs Me, as sung by the actress Shelley Duvall. Ms. Duvall's rendition of the oddball song is beautiful, memorable, and timeless. Abstract title sequence from Punch-Drunk Love with artwork by Jeremy Blake.